Banking is the business of borrowing from the public on demand, and lending those demand deposits to the public at term. “On demand” means payable immediately. “At term” means not payable until some point in the future. Therefore banking is a tightrope act where the bank hopes that depositors do not all withdraw at once. Even ten percent of deposits being withdrawn at once will collapse most banks. Business cycles are largely driven by bank lending. During the contraction phase of the business cycle, bad loans must be written off. This is where banks always fail and run to the government for bailouts. I say “always fail” because the credit contraction at the end of every business cycle produces the predictable effect that most banks find their asset sheet is far worse than they thought it was, and hit the brick wall of a liquidity crisis. BB&T was the only exception in the last crisis. This would all be fine, let them fail, except for the fact that the banks also run the payments and clearing systems for the civilized world. Think checking. The reason that banks are “too big to fail” is that the payment system cannot be allowed to fail. Virtually every business and individual in developed countries relies upon their checking account to work. Without it they cannot engage in commerce or pay their bills. 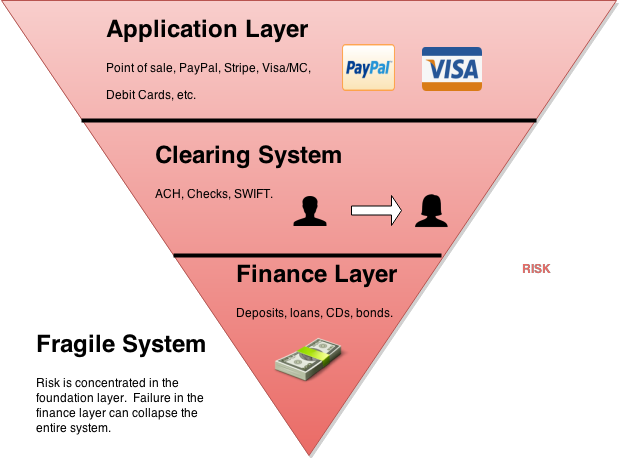 The existing banking system is a fragile upside down pyramid where all of the risk is concentrated in the “finance” layer, which is the foundation. See figure 1. It must be periodically bailed out by the government because it is fundamentally flawed. The first generation of digital gold systems, e-gold and the like, demonstrated a new business model that makes banking obsolete. They offered deposit accounts, fully backed by gold, that enabled “real time” peer to peer payments (RTGS). They charged a small, 1/2%, transaction fee, but allowed transactions to run at full throttle. There was no daily batching, weekends or holidays to slow down the movement of money. This resulted in payment systems that had very high turnover (velocity), ranging from 60 to 120 per year. The transaction fee multiplied by the velocity gives the net earnings on the deposit base. Digital gold generated 30-60 percent return per year without putting the deposits at risk. Why would we use banks as our payment system, when they put 98% of the deposit base at risk, in order to generate 2-5% profit, when digital gold can generate far higher earnings with zero risk while providing better service to the customers? The bankers couldn’t abide this, so the US Treasury shut down all the digital gold systems on US soil, killing the sector. Bitcoin rose from the ashes of digital gold. Digital gold is down but not out, however. There are half a dozen new digital gold systems in the planning stages, even as you read this. With a digital gold payment and clearing system, we can still meet the need for “finance”, which is savings, credit and securities. But we put the finance layer on top of the clearing system, not in the foundation. This firewalls the risk so that a failed lender does not endanger the entire payment system, and therefore the entire economy. Using gold as the foundation, and putting finance on top produces an “anti-fragile financial system”. Financial shocks from the failure of the central banking system will drive business into the anti-fragile gold-based system. 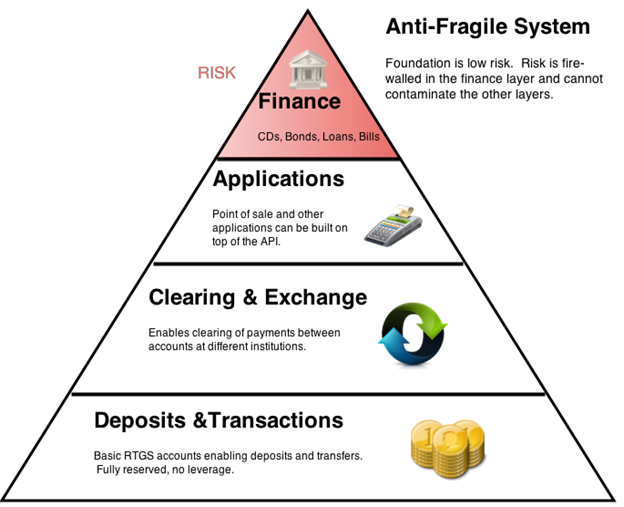 In Kenya we are starting to see the rise of an antifragile financial system. MPESA is the fully reserved RTGS mobile payments system at the foundation. Now credit institutions like MShwari are being built on top of MPESA. They make short term loans to MPESA users based on their account statistics. If Mwshari fails due to bad loans, MPESA is not threatened at all. No government bailout is called for. In 2015 we expect to see several antifragile gold-based payments and clearing systems rise like a Phoenix from the ashes. Stay tuned.